This sampler offers strong appeal with its fine central basket of flowers set on a deep green-blue lawn. The composition, with its vertical format, hillocks and baskets and nicely arcaded border, is similar to samplers worked in the classic 18th style, which was continued by many samplermakers into the early years of the 19th century. The maker was Maria Hains, and while we are unable to know specifics about her, we feel strongly that she was from New Jersey. 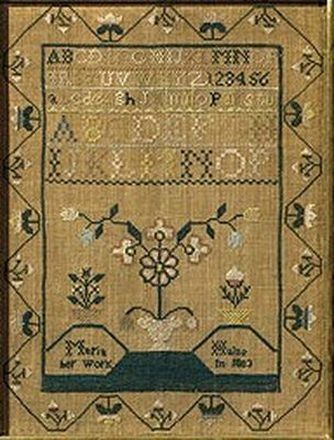 The Hains / Haines / Haynes family was prominent in southern New Jersey, and this sampler shares its specific central basket with other known samplers from this area; please refer to our Keziah A. Hilliard sampler from Burlington County, New Jersey for an interesting comparison. The basket on the lawn at the bottom of Keziah's sampler strongly resembles that on Maria's. Their stylized central eight-petaled flower sits on a vertical stem, the smaller tri-form flowers with circular cores appear directly above and they both sport angular, diamond-shaped leaves. Of additional interest to Maria's sampler are the two little pots of flowers and the hillocks which are formed of outlines that contain the name and date. The sampler was worked in silk on linen and is in excellent condition. It has been conservation mounted and is in a good mid 19th century gold leaf frame.